Forum tried to poll PC party members. What happened next was strange. Polling for a party's leadership campaign is fraught with hazard. While it can reveal how the general population and party supporters feel about the leadership candidates - and that is useful information - they can't tell us anything specific about the actual outcome. Only a very small proportion of party supporters actually vote in a leadership race, and that proportion is even smaller when we are talking about the general population. There are two ways to go about polling a party's membership. One way is to obtain a list of party members and call them, which has happened in the past. The less common route is to do a standard poll and ask people if they are party members. 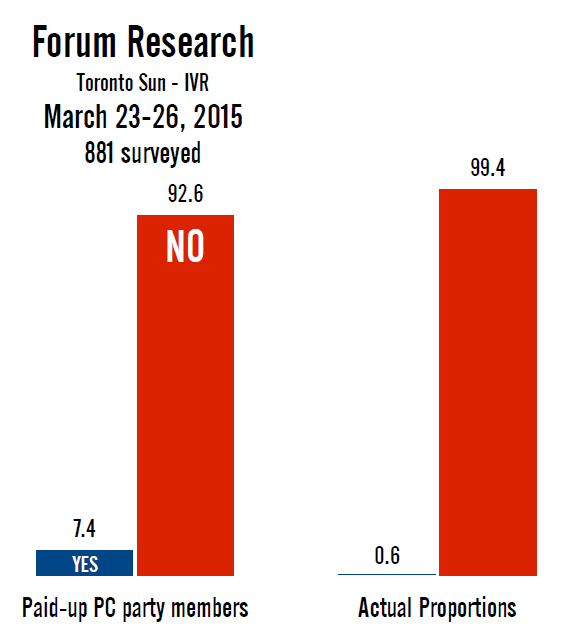 That's what Forum did in its latest poll concerning the Ontario Progressive Conservative leadership race. Good for them for trying, but logistically it should be a nightmare. According to the PCs, they have over 80,000 members, representing 0.6% of Ontario's adult population. You'd have to do a poll of 50,000 people to get a decent sample size of 300 party members, if the poll is done properly. With the response rates that IVR gets, you'd have to call about 2.5 million households. Instead, Forum polled 881 Ontarians and found 65 paid-up party members. This is revealing, for several reasons. Those 65 paid-up party members represent 7.4% of the sample, quite a bit more than what it should have been if the poll was completely random. 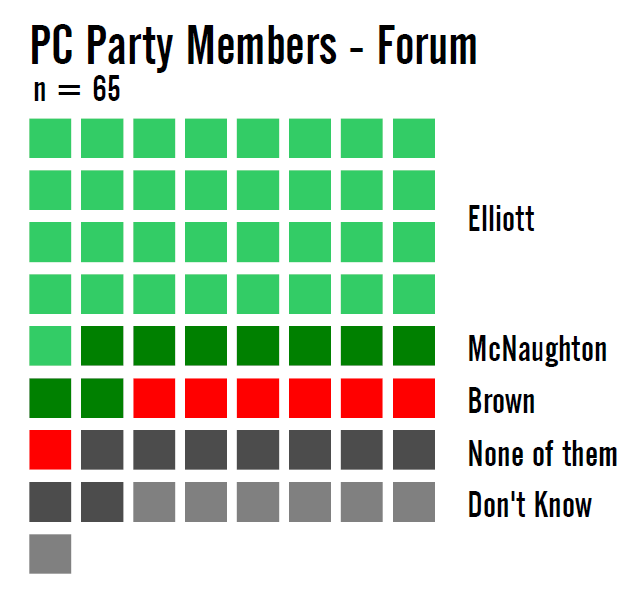 Forum found 12 times as many PC party members in its poll than it should have. This raises a few issues. First is the question of whether we can believe these 65 respondents. If the poll was done correctly, some of them would have been lying or misunderstood the question. Second is the question of accuracy. If Forum could find 12 times as many PC members as it should have, what does that say about its sampling methods? The third question is, perhaps, the most interesting one. What if active political partisans are just so much more likely to participate in a poll than the rest of the population, that being over-represented by a factor of 12 is actually not a sign of a problem with the poll, but a problem with the people who take part in a poll in the first place? Response rates are tiny these days, and particularly with IVR polling. 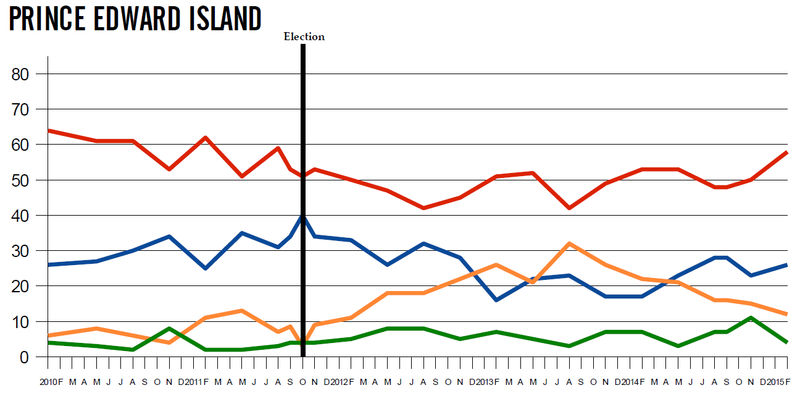 Nova Scotia's electoral laws require pollsters to report their response rates, and when Forum did in 2013 it showed that rate to be about 2% to 3%. That is a large proportion of potential voters not bothering to pick up the phone or complete the survey. If that 2% to 3% is largely made up of people who are active partisans, does that skew the poll? Other polling has shown that poll-takers are more likely to be politically active and do volunteer work. The important question, then, is whether these people are politically different than the rest of the population. If they are, than the poll will be led astray. If they aren't, than the poll will be effective. Putting aside these existential questions, the poll itself had a counter-intuitive result. PC party members broadly lined-up with the views of the general population and of PC supporters. Of those 65 people who claimed to be party members, 51% said they preferred Christine Elliott. Another 13% said they preferred Monte McNaughton, while 10% opted for Patrick Brown. 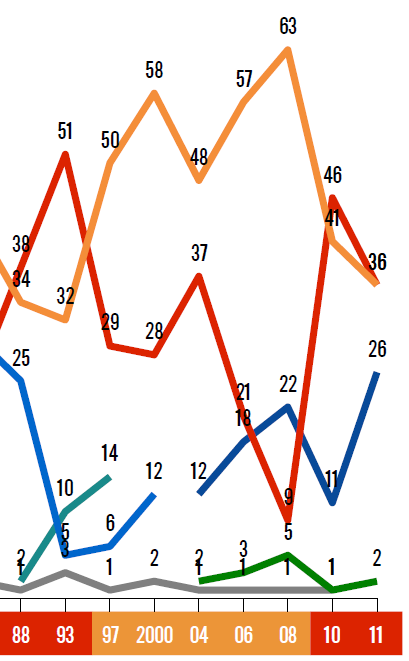 In the chart above, each box represents one of those 65 respondents. Another 14% said none of these three contestants were their preference, while 11% were undecided. 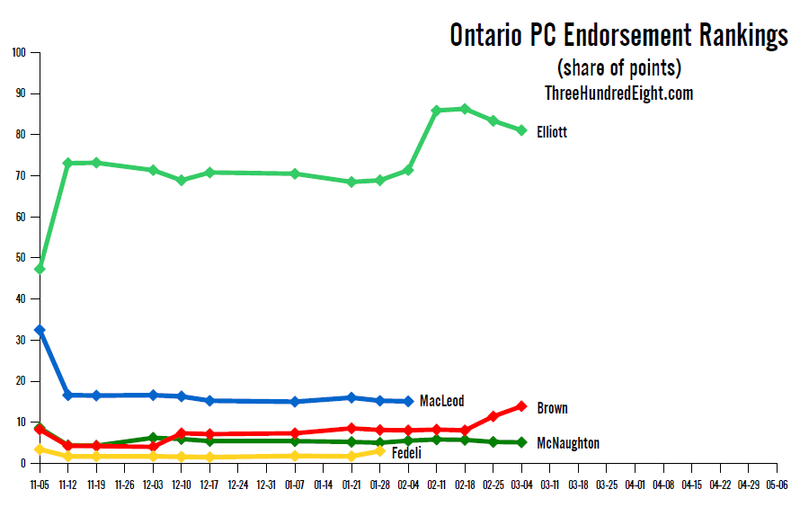 Among PC supporters, a larger group, Elliott had 35% to 15% for McNaughton and 11% for Brown. Among all Ontarians, Elliott had 24% to 7% for McNaughton and 6% for Brown. There are many caveats with these sorts of numbers, some of which were spelled out above. But the most important is, of course, sample size because the margin of error of a sample of 65 people is +/- 12.2%. When we look at the poll with these margins of error, we get a much less clear picture. Now we see Elliott at between 39% and 63%, McNaughton between 5% and 21%, and Brown between 3% and 17%. If we look at just the decided PC party members, the margin of error increases to +/- 14.1%, and Elliott's support ranges between 55% and 83%, compared to 7% to 29% for McNaughton and 4% to 24% for Brown. By these numbers, we would consider Elliott a lock to win on the first ballot. McNaughton and Brown are fighting for second place. However, we also have a pretty good idea that this is not the actual contours of the race. We won't know the final tally of each candidate's membership drive until the end of April, when the PCs release the numbers. But Brown has claimed about 40,000 members, with Elliott claiming 34,000 and McNaughton 20,000. One oft-quoted source puts McNaughton closer to 6,000, which is a more intuitive result. We just don't know for sure, though any misleading candidate will be embarrassed once the numbers are announced. So the numbers are probably not too far off, particularly if McNaughton is at 6,000 instead of 20,000 (the three claims add up to 94,000, but 80,000 if the source is correct). At those rates, Brown should be somewhere between 43% and 50% of newly signed-up members, compared to 36% to 43% for Elliott and 8% to 21% for McNaughton. This ignores the voters that were already with the party when the race started (some 10,000) and those signed up by Vic Fedeli and Lisa MacLeod (both of whom endorsed Elliott). So now we get to the question of accuracy. Considering the limitations of Forum's poll, their Elliott numbers are, perhaps, plausible. Those undecideds could be from the ranks of the original party members, who should represent some 13% of the total. 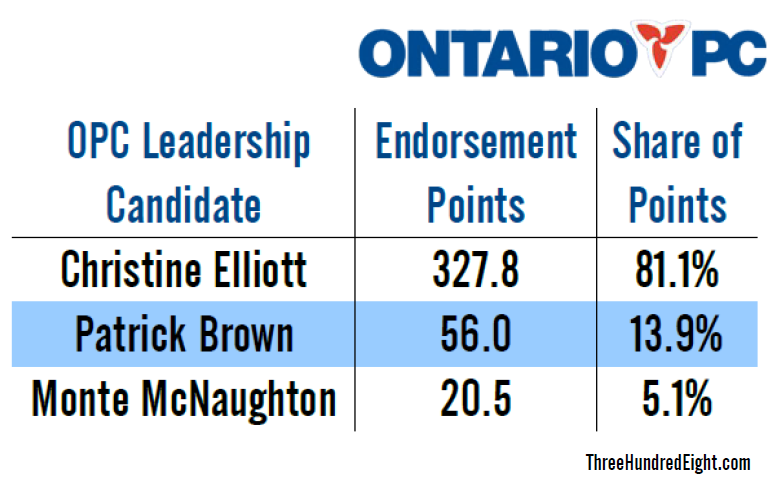 But to have Brown and McNaughton within the same error bands with at most half of Elliott's support, and McNaughton narrowly favoured among the two, does not quite align with what we know about the race. This really puts the poll in question, and highlights the limitations of this attempt at getting at the voting intentions of party members. Does Elliott really have the kind of advantage that Forum gave her? It doesn't seem so, but we won't know for sure until the votes are counted in May. A few threads run through the history of Winnipeg North. One is that the riding has, for the great bulk of its history, kept itself out of the corridors of power. Another is the thread of the labour movement, and the spectre of communism. 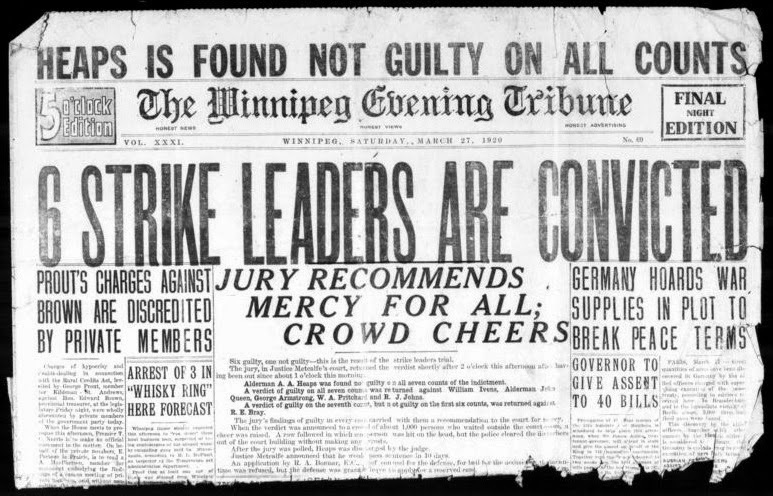 Accordingly, our story starts with the Winnipeg General Strike of 1919. Winnipeg North was created in 1917. Its predecessor ridings were those of Selkirk and Winnipeg, which it shares in common with the riding of Winnipeg South Centre. You can review the history of these ridings prior to 1917 here. Winnipeg North's first MP was a Conservative, Matthew Blake. A physician born in Ontario and educated in Toronto, Dublin, and London, Blake won the riding in 1917 with 74% of the vote, easily trouncing his Liberal opponent in the midst of the First World War. That war was good for business - but not so great for workers. When the strike was launched in May 1919, a few months after the end of the war, it found in Matthew Blake an opponent. Speaking of the strike in the House of Commons on June 2, 1919, Blake theorized that "the aim and object of many of the workingmen today seems to be to get the most possible money for the least possible expenditure of energy. The tramp says the world owes him a living, and he is going to get it. I hope we are not coming as a nation to the same status as the tramp." Suffice to say, Blake was defeated when he faced his tramp-like constituents again in 1921. It was an election dominated by memories of the strike. Opposing him were Robert Russell, the Socialist candidate and a leader of the strike, who captured 29.4% of the vote, and Edward McMurray, a barrister who had served as defense counsel for the strike leaders. McMurray won the riding for the Liberals in a close-run three-way race, with 36%. Blake saw his support collapse to just 29%, putting him in third place. McMurray was named Solicitor General of Canada in 1923. As was the convention at the time, he forced a by-election to be held. But rather than allow McMurray to be acclaimed, as was also the convention, the Labour Party put up a candidate (the Conservatives did not). This was Abraham Heaps, another one of the strike leaders, and he captured 33% of the vote. McMurray prevailed with 65%. He stayed in his post until 1925, when he resigned "over matters of a professional and private nature". But he took another shot at re-election - as did Blake. But it was Heaps of the Labour Party that won, taking 39% of the vote to 32% for Blake's Conservatives and McMurray's Liberals. 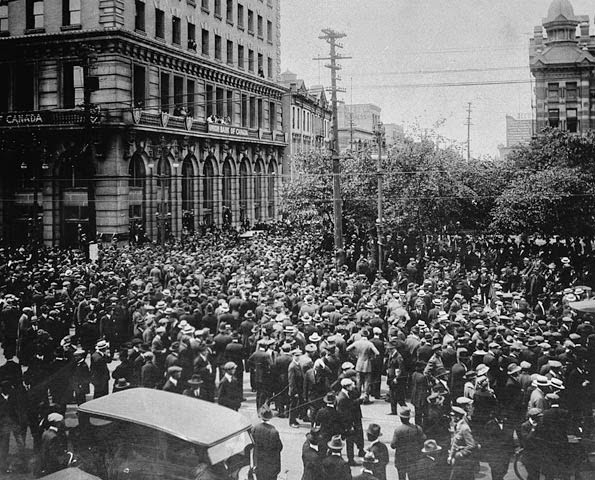 Heaps had been jailed during the strike, but was later acquitted of sedition. He had political experience, being a city councilor for Winnipeg since 1917. He had labour experience as well, being a member of the Trade Union Council. 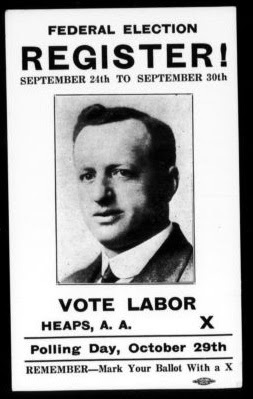 He was the strikers' man, and he was re-elected easily in 1926 and 1930, taking 49% of the vote in each election. Poor Blake even tried another comeback in 1930, only to fall short for the third time. By the 1935 election, Heaps and other MPs from the labour side of the spectrum had joined together to form the Co-operative Commonwealth Federation (CCF). Under this new banner, Heaps again won re-election with 42% of the vote, defeating the Liberals and the leader of the Communist Party, Tim Buck, who captured 25%. The storm clouds of war were gathering over Europe, and in the House of Commons Heaps fought against putting quotas on Jewish immigration. But when war broke out, Heaps, a pacifist, was on the wrong side of the debate. His opposition to the war did not go over well with Jewish voters, and he was defeated in 1940. 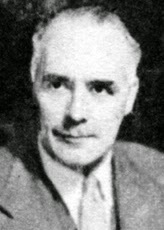 The winner was Charles Booth of the Liberals, who had failed to win the riding in 1935. The riding could not have swung any more dramatically, as Heaps the pacifist was replaced by Booth the war hero. A veteran of the First World War and a pilot who served with the Royal Air Force and the Royal Canadian Air Force in the 1920s, including a stint in northern Russia during the Russian Civil War fighting the Bolsheviks, Booth renewed his service during the Second World War. He was posted to the 1st Canadian Corps HQ in London, and was named a Brigadier and Deputy Adjutant General in 1943. Due to these responsibilities, however, Booth only sat in the House of Commons once, while he was on leave from duty. Booth decided not to run for re-election in 1945, and the riding swung back to the CCF. Alistair Stewart, a Scot who immigrated to Canada at the age of 25, was an accountant and a founding member of the party. He took 38% of the vote as the Communists finished in second place with 27%, beating out the Liberals. Stewart would secure re-election three more times in 1949, 1953, and 1957. By the end of his tenure, he was capturing 49% of the vote. The Liberals managed to move back into second place, as the Communists were replaced by the Labour-Progressives. Nevertheless, the LPP captured 17% of the vote in 1949, but that dropped to 8% by 1953. By 1958, the tide was turning and the Progressive Conservatives under John Diefenbaker, elected to a minority government the year before, stormed the electorate to win a huge majority. Murray Smith, the PC candidate in Winnipeg North, was one of the beneficiaries, eking out a victory with 42.4% of the vote to Stewart's 42%. Smith was the first Tory elected in the riding in over 40 years. He would also prove to be the last. Smith was the first MP for the riding to have been born in Manitoba, and 1958 had another first for Winnipeg North. Nina Partrick, a 'housewife', was the Liberal candidate and the first woman on the ballot in the riding. She took just 12% of the vote, the worst the Liberals would ever do in this riding until 2008. The riding returned to form in 1962, as David Orlikow, a pharmacist and labour educator, won the riding for the newly formed New Democrats. He captured 37% of the vote, as Smith's PCs dropped to 28%. Orlikow was an experienced politician, having been a municipal alderman and later a CCF and NDP MLA in the Manitoba legislature. He would hold numerous critic portfolios in his long tenure as an opposition MP. But he might best be remembered for a strange situation involving his wife, the CIA, and experiments with mind control. He should also be remembered as Winnipeg North's longest-serving MP, occupying the post for over 26 years and serving under Tommy Douglas, David Lewis, and Ed Broadbent. He was re-elected an incredible eight times, capturing over 40% of the vote in every election between 1965 and 1984 (and a majority of it in 1979 and 1980). He fended off the Liberals in the 1960s, including in 1968 when Pierre Trudeau won his first election and the Liberals came close to ousting him. He then fended off the Progressive Conservatives, who supplanted the Liberals as runner-up in the 1970s and early 1980s. But Orlikow's winning streak came to an end in 1988, when he was defeated by Rey Pagtakhan of the Liberals. Pagtakhan was the first MP from the Philippines to be elected to the House of Commons, fittingly for a riding that is today the one with the most Filipinos in the country. A doctor and school trustee, Pagtakhan took 38% of the vote in the 1988 election, just squeezing past Orlikow's 34%. The Tories took 25% in this close race. Also on the ballot here in 1988 was a candidate for the fledgling Reform Party, capturing 2%. Pagtakhan was re-elected in 1993, as the PC vote collapsed to just 5% here and the NDP dropped to 32%, marking its worst performance in its history (including that of the CCF). In 1996, Pagtakhan was named Parliamentary Secretary to the Prime Minister, the first MP from Winnipeg North to get this close to cabinet since the days of McMurray. The riding boundaries shifted in 1997, and Pagtakhan went on to run in Winnipeg North - St. Paul. The new boundaries helped the NDP in Winnipeg North Centre, as Judy Wasylycia-Leis won it for the NDP with 50% of the vote. And this after her dismal performance in Winnipeg North in 1993. Wasylycia-Leis had a long history with the NDP at this point, being a staffer for the party and a provincial candidate for the Ontario NDP. She sat in the Manitoba legislature as an NDP MLA from 1986 to 1993, and was a cabinet minister over that time. She captured 58% of the vote in 2000, at that moment the highest share of the vote won by any party in the riding since 1923. The boundaries shifted again in 2004, and Winnipeg North took its present shape. Pagtakhan decided to run here for re-election after successfully winning in 1997 and 2000, but fell short. Wasylycia-Leis took 48% to Pagtakhan's 37%. She returned to her thumping victories in 2006 (57%) and 2008 (63%) as the Liberals' vote collapse - first to 21% in 2006 and finally 9% in 2008. The Conservatives moved back into second place here, but with 22% were still far behind. In 2010, however, Wasylycia-Leis resigned her seat to run for mayor in the first of two unsuccessful bids for the job. The by-election was supposed to be an easy win for the NDP, coming off their 40-point victory in 2008. But the Liberals managed to recruit Kevin Lamoureux, a long-time Liberal MLA for the riding of Inskter first elected in 1988. He ran twice for the provincial party leadership, in 1993 and 1995, losing both times. With Lamoureux on the ballot, the Liberals pulled off a stunning victory with 46% of the vote, the party's best performance since 1993. The NDP finished second with 41% of the vote. Nevertheless, the riding was still dominated by the NDP's long history. And in the context of a worst-ever performance nationwide in 2011, Lamoureux would not have an easy time securing re-election in 2011. He managed it, though just barely. With 9,097 votes, Lamoureux beat out the NDP's Rebecca Blaikie, who took 9,053 votes. Two-tenths of a percentage point separated the two, as the Conservatives improved their share from 11% in the by-election to 26%. But coming from such a low ebb, Winnipeg North looks to be a Liberal hold in the coming election. In the context of its history, however, that makes it - for the time being - a Lamoureux riding. Over the last 90 years, an MP from Labour, the CCF, or the NDP has failed to win only six times. That is a lot of historical baggage for the Liberals to keep locked away indefinitely. The federal projection has been updated, incorporating the latest polling data from EKOS Research, Léger, and CROP. The overall results have not shifted much, though the Conservative seat count has dipped to the benefit of the Liberals. You can see all the details here. An interesting development does seem to be underway in Alberta, however, where the New Democrats are polling at their highest level in a year. Is the NDP on the upswing in the province for real? First, let's briefly go over the new polls added to the model. 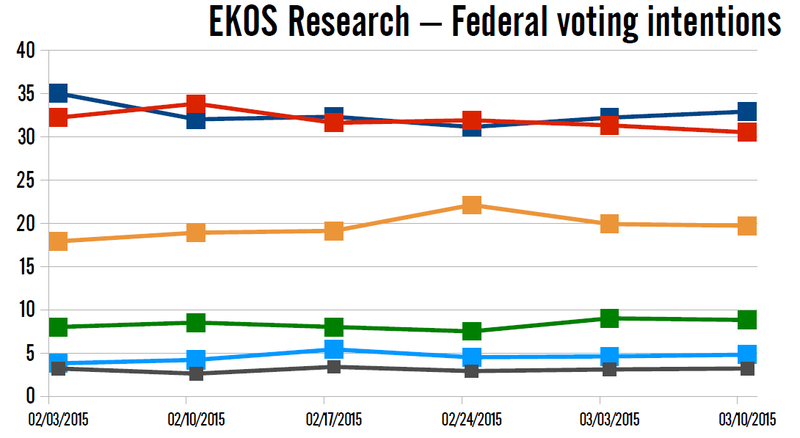 In EKOS's poll for iPolitics, the Liberals moved ahead with a gain of 1.6 points since the previous week to 32.1%. The Conservatives dropped 2.7 points to 30.2%, while the NDP was up 1.5 points to 21.2%. Only the Conservative decrease was outside the margin of error, though the Liberal bump does end a losing streak for the party. 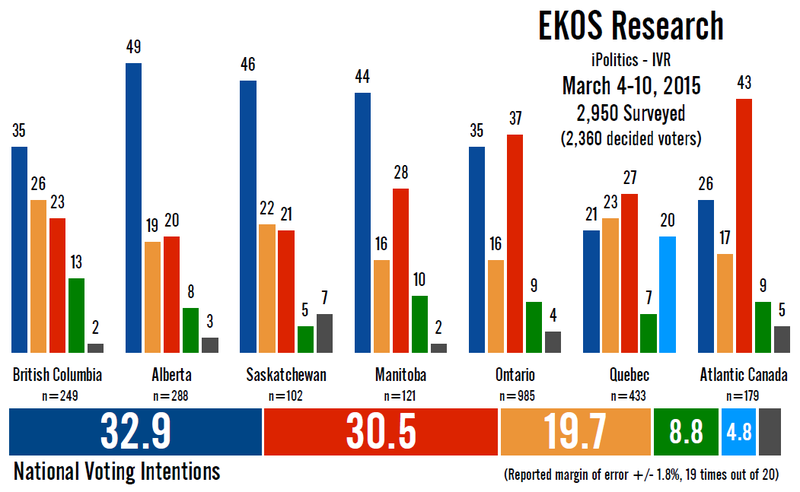 Overall, however, the poll is well within EKOS's usual range. The Léger poll reported by CTV Montreal showed a similarly close race, with the Liberals at 35%, the Conservatives at 34%, and the NDP at 20%. Compared to Léger's previous poll of Jan. 30 to Feb. 2, the Liberals held firm, the Tories were up two, and the NDP was unchanged. Suffice to say, those shifts would not be outside the margin of error of similarly sized probabilistic samples. Finally, the poll by CROP for La Presse gave the New Democrats the lead in Quebec with 30%, unchanged from CROP's previous two surveys in the province. The Liberals dropped four points to 29%, while the Conservatives were up two points to 18% and the Bloc Québécois was up one point to 18%. None of these shifts would be statistically significant. Noteworthy, however, is that the Liberals have dropped in two consecutive surveys (from 37%) while the Conservatives have increased their support over that time (from 13%). Also note that the results from CROP are broadly in agreement with those from Léger for the province. The longest and largest streak (both in real terms and proportionately) in the country currently belongs to the New Democrats in Alberta. Their numbers have been increasing over five consecutive weeks in the province, from 11.9% at the beginning of February to 16.3% in today's update. That is a gain worth 4.4 points, or an increase of more than one-third since that low ebb. This upswing for the NDP in Alberta has coincided with a period of Conservative decline, as the party has slipped 4.2 points over the last five weeks from 54.7% to 50.5%. This jump for the NDP has pushed the party to two seats in the projection (Edmonton Strathcona and Edmonton Griesbach, though the latter is by a very slim margin). It has also put the New Democrats in play in Lethbridge. The shift has been registered in most polls. In the two newest surveys, Léger has the NDP up five points in the province and EKOS has them up almost 10 points since the poll it conducted at the same time as Léger's last outing. Over the last eight polls, the NDP has managed between 13% and 19%. In the previous eight, that range was from 10% to 17%. Whether or not the increase has come directly from the Conservatives is harder to determine. In those same most recent eight polls, the Conservatives have ranged between 49% and 54%. In the previous eight, that range was 47% to 61%. That suggests the Tories' numbers have just become more volatile, rather than necessarily dropping in the face of NDP gains. The reality is rarely ever linear, and in this instance we may be seeing voters heading in every direction, the net result being an NDP uptick. But why would this be taking place? We cannot definitively chalk it up to an improved performance by Thomas Mulcair, whose personal numbers in Alberta show no such clear trend line as those of his party. We instead might be seeing a bit of cross-pollination between the provincial and federal scenes. Talk in Alberta is about the possibility of the New Democrats, under new leader Rachel Notley, taking over from Wildrose as the Official Opposition after the next election. The better press for the provincial NDP may be having a positive impact on the federal party. The real question, as is always the case, is whether or not these numbers will prove to be sustainable or a mere flash in the pan. In the grand scheme of things, it does not have much impact on the national portrait. But with the race looking as close as it is, even losing an extra seat or two to the NDP in Alberta can have an important effect on the Conservatives' electoral calculations. Yesterday, Angus Reid released the results from their quarterly polling on the approval ratings of Canada's premiers. As usual, Brad Wall of Saskatchewan topped the list while Manitoba's Greg Selinger, after almost losing his job in a leadership vote, was at the bottom. But the poll did have some interesting findings - namely that two of the premiers heading to the polls this year have decent numbers and that, for the most part, premiers are unpopular. Update: It was indeed a typo, but Gallant's DK was 10 points too high, rather than his disapproval rating. It has been fixed below. Angus Reid caught it earlier, but the wrong version of the PDF was still in my cache. Apologies. Before we get into the poll, a note on the numbers for Brian Gallant of New Brunswick. In Angus Reid's poll, the numbers for Gallant added up to 110%. I corrected this in the chart below by reducing Gallant's disapproval rating by 10 points, which aligns more closely with Angus Reid's previous poll. This would mean his 43% disapproval was a simple typo, and should have been 33%. I have checked with Angus Reid and will update once I have the correct numbers. Let's start with the two premiers who will be asking for a mandate of their own this year (Wade MacLauchlan of Prince Edward Island is the third, but Angus Reid does not include the province in its poll - with good reason, as even with a sample of 6,278, PEI's share of that would represent just 27 respondents). Jim Prentice of Alberta registered an approval rating of 43%, representing a drop of seven points for the PC leader since the last quarter. His disapproval rating was up six points, to 39%. That is not a positive trend for Prentice, but with the divided opposition he faces he can easily win with 43% support. In fact, Alison Redford took 44% of the vote when she won the 2012 election, so Prentice appears in a good enough position. And with a new rating of +4, Prentice is one of only two premiers with a net positive score. Paul Davis of Newfoundland and Labrador had similar numbers to Prentice, with 41% approval and 43% disapproval. That is a sharp improvement for Davis, who had an approval rating of just 34% last quarter. His disapproval rating, however, was also up, by six points. The issue with Davis is that in a three-party system where the third party may take just 10% of the vote, 41% would not be enough to win. And the polls by the Corporate Research Associates show that satisfaction with the PC government in the province is relatively high - and yet, the governing party is trailing in the polls at a great distance. It is almost as if Newfoundlanders and Labradorians have gotten over the anger they felt with the Dunderdale administration, but still want a change. That will be tough for Davis to overcome. Two premiers have a year to go before the next election in 2016, and they could not be any more different. Wall topped the list yet again with an approval rating of 64% and a disapproval rating of 30%, the highest and lowest scores, respectively, in Canada. His net rating is a remarkable +34, the best by a wide margin. And that 64% approval, in fact, matches the share of the vote his party took in the 2011 provincial election. He would seem to be in fine form to secure re-election, which no one doubts at this stage. His numbers have slipped a little, as they have dropped for three consecutive quarters. But the shifts have been marginal, and he has a lot of room to fall before he has to worry. At the opposite end of the spectrum is Selinger, who found himself at the bottom of the list again. His approval rating stands at just 22%, with disapproval at 63%. That is an improvement for Selinger, who was at just 17% last quarter, but it still makes for the two worst quarters for the NDP premier in Angus Reid's polling. It spells doom for his party's re-election chances, and that is part of the reason he almost lost a leadership vote a few weeks ago. His net rating of -41 is the worst in Canada, again by a wide margin. The other premiers on the list are at least two years away from having to face the voters, so this poll is more of a mid-term check-up. The two Atlantic Liberal premiers, Gallant and Stephen McNeil of Nova Scotia, have decent scores. McNeil put up an approval rating of 43% and a disapproval rating of 44%, rather standard fare for a sitting premier. But he has dropped in three consecutive quarters, after posting an approval rating of 66% in June 2014. Gallant has rather mixed numbers for a newly-elected premier, at 40% approval to 43% disapproval. His disapproval rating is up rather sharply. The two central Canadian Liberal premiers, Kathleen Wynne of Ontario and Philippe Couillard of Quebec, are seeing their numbers turn a little sour. Wynne's approval rating has dropped over two quarters now to 36%, with her disapproval rating at 53%. Her net rating is a poor -17. But this negative trend is lessened somewhat by the fact that Wynne's numbers are now more or less back to normal, after experiencing a post-election bump. Couillard might be a little more worried, with an approval rating of 35% and a disapproval of 58%. That represents a drop in his approval worth six points, and his net score of -23 is the lowest in Canada with the exception of Selinger and Christy Clark of British Columbia. Coupled with a new poll out today from CROP showing his party dropping to just 29% support, Couillard seems to be experiencing the same post-election slump that Jean Charest went through when he first became premier in 2003. Finally, Clark's numbers are holding steady with 33% approval and 60% disapproval, though that is a far cry from the post-election honeymoon of a 45% approval rating that Clark had in 2013. Only Selinger's net rating is worse than Clark's -27. But she doesn't have to face the electorate until 2017. Of course, poor approval ratings are certainly something she is familiar with and, undoubtedly, it probably doesn't scare her after the 2013 experience. As mentioned above, the poll does suggest that Canadians are not very happy with their premiers. In only Saskatchewan do a majority of respondents approve of their premier, and in four of the nine provinces polled (including the three largest) a majority disapprove of their premiers. Seven of the nine boast negative net ratings, and five of them have been in office for about two years or less. Their numbers are bound to get only worse. What does this mean? Are we just poorly served by our leaders, or are Canadians so polarized that many find it hard to support a leader for whose party they did not vote? In no province does the current approval rating of the premier stand at a higher level than the share of the vote that premier's party took in the previous election. In Quebec, British Columbia, Manitoba, and Newfoundland and Labrador it is significantly lower than the bar set by the last election. Perhaps it isn't a sign of a serious problem with our leaders or our politics, but rather a case of the grass always being greener on the other side of the fence. One hopes our collective psyche is not as simple as that. In my column for the CBC today, I look at the latest numbers from the projection, which was updated late yesterday afternoon. Please check it out. Those are the macro numbers. What about the micro numbers? I thought it would be interesting to break the projection down to the sub-regional level to try to get an understanding of how things are playing out. Seeing the numbers in Ontario, Quebec, and British Columbia are fine - but these provinces are far from monoliths. In fact, every province is. What I've done below is use the riding-by-riding projections to get an estimate of regional support. But pay attention, as there are some caveats. This is not the same as the polling averages for these regions, but rather how the national polls translate into regional support levels. So, it is not necessarily reflective of how things are really looking in every part of the country. What it tells us instead is that, based on wider trends, these are how these regions are likely playing out. It is meant to give us a general idea, rather than a specific measure of public opinion. In effect, it is using the projection model to project regionally, rather than by riding. But it isn't as simple as swinging the national polls and their provincial breakdowns to the regional level, as the riding projections take into account incumbency and the like. If a region has seen a lot of incumbents retire, that has an effect that a simple swing would not capture. By-elections, too, are also part of the equation. As to the definitions of the regions, I used the ones presented here on Wikipedia. It is perhaps not a perfect division of the country (I would have done some of these differently), but it is good enough. Let's get to it. Starting in British Columbia, the Conservatives are strongest in the B.C. Interior, where the New Democrats are running a decent second. The Tories are also ahead in the Fraser Valley and the Southern Lower Mainland, but here it is the Liberals who are running a close second. The Liberals have the edge in Vancouver and the Northern Lower Mainland. The Conservatives and New Democrats are in a close battle for second, though even here we're looking at a sub-regional race: the NDP in Vancouver itself, the Conservatives further out. The only regional lead the New Democrats hold in British Columbia is Vancouver Island, where they are narrowly edging out the Conservatives. But look at the Greens here - they are certainly in the race in this part of the province. Alberta is far more complicated than the wide lead the Conservatives hold would suggest. Certainly the Tories are ahead through the province. But that leads runs from a very comfortable 46-point edge in rural Alberta to a slimmer margin of 13 points in Calgary. The Liberals are clearly running second in Calgary by this measure, but are in a closer race with the New Democrats in and around Edmonton. The Conservatives are well in front in rural Manitoba, where the Liberals trail in second at some distance. In Winnipeg, however, the tables are turned. There, the Liberals are comfortably ahead, with the Conservatives in second. The definitions that Wikipedia had for the regions of Saskatchewan were not very satisfying, and I suspect they are a relic of the old urban-rural seats the province used to have. With their definitions, the Conservatives lead in both the south and the north, with the Liberals and NDP in a close race for second in the south (which includes Regina) and the NDP ensconced alone in second place in the north (which includes Saskatoon). A more reasonable regional breakdown would be between rural and urban Saskatchewan. What I have done here is define Regina and Saskatoon as the six ridings with those cities in their names. When we do that, we see the race is much closer, with the Conservatives narrowly ahead of the NDP and the Liberals not too far behind. In the rest of Saskatchewan, the Conservative lead is not challenged. The Ontario numbers are interesting in that they show the wide regional variations that exist in the province, with 30 points separating the best and worst performances for the Conservatives, 24 for the Liberals, and 19 for the NDP. The Liberals have the edge in Ottawa, suburban Toronto, central Toronto, and Brampton - Mississauga - Oakville. Only in central Toronto do the New Democrats supplant the Conservatives for second place. The Tories, meanwhile, are in front in eastern Ontario, central Ontario, Hamilton - Burlington - Niagara, midwestern Ontario, and southwestern Ontario. In these regions their main opponent is less consistent. The Liberals are second in eastern, central, and midwestern Ontario, while the NDP is vying for that position with the Liberals in the southwest and the Niagara Escarpment. The New Democrats are only in first place, and in this case they are tied with the Tories, in northern Ontario. And even there the Liberals are only two points behind. Southern Durham - York is a close race between the Liberals and Conservatives. The problem for the Liberals in Quebec is demonstrated by this breakdown. Though they lead province wide, at the regional level that translates only to a lead in western Montreal and northern Montreal - Laval. They are also in a close race with the New Democrats in eastern Montreal and Montérégie, south of the metropolis. 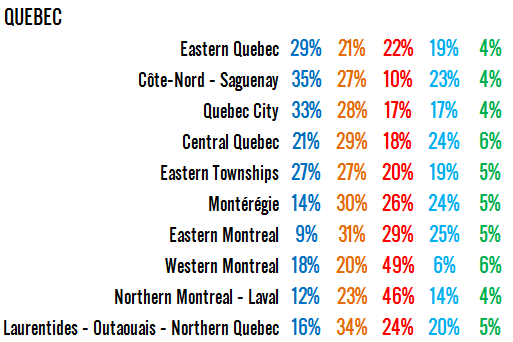 The NDP's support is relatively uniform, and in a divided landscape they are ahead in central Quebec and Laurentides - Outaouais - Northern Quebec. In the Eastern Townships they are neck-and-neck with the Conservatives. The Tories have the edge in eastern Quebec, Côte-Nord - Saguenay, and Quebec City, generally where they are expected to pick up seats. Their lead in eastern Quebec is a bit distorted by the region stretching to the south shore to Lévis. Finally, the Bloc Québécois is ahead nowhere in the province, though is not far behind in central Quebec, eastern Montreal, and the Montérégie. The Wikipedia regional definitions for Atlantic Canada don't go beyond the provincial level, so these numbers aren't as useful. We sometimes get provincial breakdowns in the polls anyway. But as a proof of concept, it works as the numbers generally line-up with what the polls are showing in each of these provinces. The Liberals lead in all four, but have a closer race in New Brunswick, where the Conservatives are strongest. Let's try to break it down a little more. In Newfoundland and Labrador, for instance, the Liberals would be ahead in Avalon and St. John's with 43% to 34% for the NDP and 17% for the Conservatives. In the rest of the province, that would be 67% for the Liberals, 19% for the Conservatives, and 9% for the NDP. In Nova Scotia, the Liberals would be ahead of the NDP in Halifax with 47% to 28%, with the Conservatives behind at 16%. On Cape Breton, it would be 64% for the Liberals to 19% for the Tories and 10% for the NDP, while in the rest of Nova Scotia the Liberals would be ahead of the Conservatives with 46% to 30%, with the NDP at 15%. And in New Brunswick, the Liberals would be ahead in the urban ridings (Fredericton, Moncton, Saint John) with 43% to 31% for the Tories and 17% for the NDP, with the margin narrower in the rest of the province, with 40% for the Liberals and 32% for the Conservatives to 19% for the NDP. Looking at the map this way, we get a different picture of the electoral race. Simplified, there are three battleground provinces: British Columbia, Ontario, and Quebec. But breaking it down by region, we see that there are many more battlegrounds. The Liberals and Conservatives are fighting over the Fraser Valley and Southern Lower Mainland in British Columbia, Calgary in Alberta, Winnipeg in the Prairies, the outlying areas of the GTA in Ontario, and New Brunswick in Atlantic Canada. The Liberals and NDP are contesting central Toronto and northern Ontario, as well as the francophone areas around Montreal and St. John's in Newfoundland and Labrador. The NDP and Conservatives are at odds too, over Vancouver Island (where the Greens are also present), urban Saskatchewan, southwestern and northern Ontario, central Quebec and Quebec City. And some parts of the country, particularly in Quebec but also parts of Ontario and British Columbia, have areas where three (or four!) parties can pose as legitimate winners. It makes for a complicated electoral map - one that we usually only get to see from 30,000 feet. Zoom in and the picture gets fuzzier, but an impression of how things are lining up can be seen. 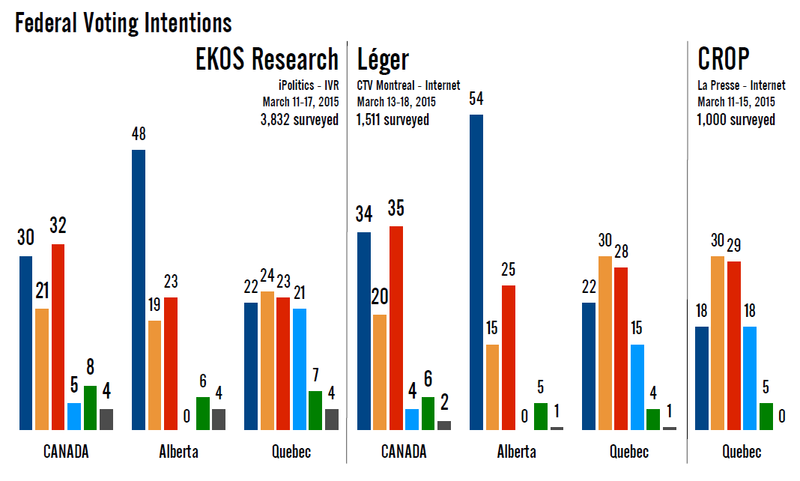 At the moment, the only pollster giving us regular updates on the political situation in Canada is EKOS Research. The firm is reporting every week on Fridays via iPolitics. This far out from the election, the week-to-week changes have been usually quite marginal. But this may be masking a wider trend that is not a good one for the Liberals. The latest numbers from EKOS put the Conservatives ahead with 32.9% support, an increase of 0.7 points since the previous week of polling. The Liberals were down 0.8 points to 30.5%, while the New Democrats slipped 0.2 points to 19.7%. The Greens were down 0.2 points to 8.8% and the Bloc was up 0.2 points to 4.8%, while 3.2% of respondents said they would vote for another party. None of these variations were outside the margin of error. Also note that this poll has not yet been added to the projection. EKOS's reports contain tracking data stretching back to the beginning of 2012. That gives the numbers good context, but makes it difficult to look at the week-to-week trends the pollster is recording. So let's focus on that. When we look at the polls over the last few weeks, it is difficult to discern any serious trends. The Conservatives seemed to be trending downwards slightly, before up-ticking over the last two polls. EKOS's method of reporting to the first decimal point makes it look like there is more movement than there really is - if we round off those numbers as other pollsters do, the Conservatives have polled at 35%, 32%, 32%, 31%, 32%, 33%. Really not much movement there, and we can't even find a statistically significant shift between their current 32.9% and their high and low marks since EKOS began reporting weekly. Not so for the Liberals, however. Their trend line is slightly negative starting with the poll ending on February 10, when the party was at 33.8% support. The drop of 3.3 points since then is outside of the margin of error. We could indeed be looking at an actual decrease in Liberal support over the last few weeks. The issue, though, is that it is difficult to corroborate this with other polls as there haven't been many that have been conducted over the same time period as EKOS. What we do see is that Abacus Data recorded an uptick in Liberal support worth two points between its polls of January 26-28 and February 12-16, while Nanos Research had the Liberals down two points between its four-week rolling polls ending February 20 and February 27. That the Conservatives are stable seems to be the consensus opinion of the polls. The question appears to be whether or not the Liberals are on the downswing. In terms of seats, the Conservatives would win about 148 with these levels of support, with the Liberals taking 120 and the New Democrats capturing 54. The Bloc Québécois, benefiting from low NDP support in Quebec, could win about 14 seats despite having dropped more than three points in support since 2011. The Greens would win two seats. Back to the EKOS poll itself, the only regional result worth looking at is British Columbia. Last week's EKOS poll had the Greens at 21%, and solicited some excitement on the part of Greens in the province. It also happened to have the Conservatives at just 23%. Now, we see the Conservatives jumping 12 points to 35% and the Greens falling eight points to 13%. Both of these shifts are outside the margin of error, but it looks to me like a reset (and maybe an over-correction) rather than an actual shift in voting intentions. The result of March 3 certainly stands out from the pack. The March 10 result also stands out, but seems much more intuitive and matches some of the results other pollsters have recorded in British Columbia. It does correspond with weaker than usual numbers for the Liberals (23%, rather than the 28% to 33% recorded in earlier polls), so we could see another reset next week with the Liberals up. Here again, the March 3 result stands out rather dramatically. The conclusion we should reach is that, as far as B.C. was concerned, the March 3 poll was a bit of an outlier. Nothing wrong with that as it should happen from time to time, but it was a lot of fuss for not much at all. Moving on, I though it would be interesting to note EKOS's results on support for the mission against ISIS. Overall, 60% of Canadians support the mission while 33% oppose it. But the party breakdowns shed some light on the politics of it all. The Conservatives are safest in their robust support for the mission, as 80% of their voters are in favour of the mission. Only 16% aren't. The New Democrats are better positioned to be the voice of opposition, as 45% of their voters do not support the ISIS mission. Nevertheless, 54% do. It is a damned if you do, damned if you don't situation for Thomas Mulcair, but his opposition to the mission fits within the historical position of the New Democrats. And the Liberals off-again-on-again relationship with the mission can perhaps be best explained by these numbers: 38% of their voters oppose the mission, while 60% support it. The party has not seemed quite comfortable with the position it took in September, and their supporters seem to agree. It will be interesting to see whether the Liberals will walk it back when the vote for renewal comes up. The Greens are looking to make a splash in 2015. This past weekend, Les coulisses du pouvoir on Radio-Canada interviewed the appropriately named Daniel Green, who is one of the Green Party's deputy leaders and, apparently, the man who will lead the Greens' campaign in Quebec. In that interview, Green acknowledged that the party won't form government. But with enough MPs (Green speaks of five to seven), it could hold the balance of power. Coupled with the EKOS poll from last week that had Green tongues (and perhaps Daniel Green's as well) wagging, I took a look at the Green Party's chances in British Columbia in 2015 for my CBC column this week. Check it out. Here, I thought we should take the exercise a little further and identify the ridings the Greens should be targeting to reach the 12-seat mark generally required to obtain official or recognized party status in the House of Commons. 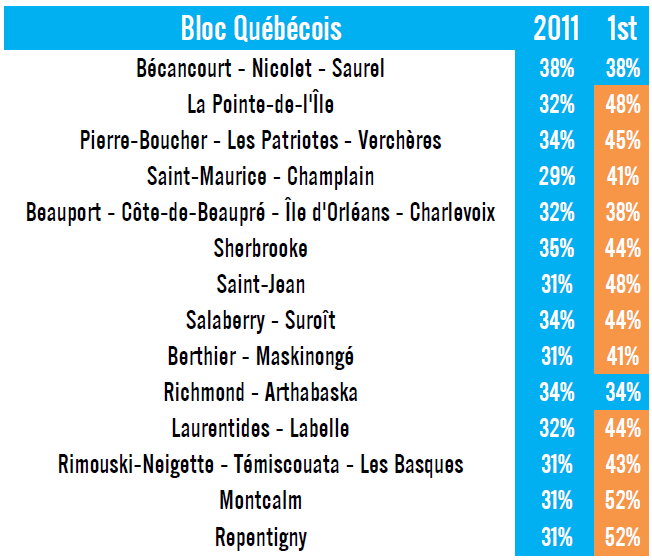 And while we're at it, let's look at the seats the Bloc Québécois needs to target to reach that same level. These seats were identified by using the seat projection model's current levels of support, and increasing those levels of support proportionally throughout Canada. So, for example, doubling the Greens' support in British Columbia is worth more than, say, Quebec. I was also agnostic about where the Greens' new found support would come from, with other parties dropping proportionately to their current standing. I've separated the Green list of 14 seats (two extras for good measure) into four tiers of winnable seats. Note that the percentages listed are those for the new electoral boundaries. The riding of Thunder Bay - Superior North (Bruce Hyer's) is not included in this list, because on paper it is not a winnable one for the Greens. Hyer may single-handily win the riding, but that is the kind of thing the model will miss without some riding-level polling. An honourable mention should also go to the riding of Fredericton in New Brunswick, as a Green MLA was elected within it last year. That means a critical mass of voters willing to vote Green, and that gives them an outside shot. The first tier is all in British Columbia, and the three seats in it are the ones the Greens will be targeting most forcefully in the province. Elizabeth May's riding of Saanich - Gulf Islands is first among them, of course, and she should have no problem being re-elected. Next is Victoria, where the Greens took 12% of the vote in 2011, against 51% for the NDP. But in the 2012 by-election in the riding, the Greens captured 34% to 39% for the NDP, at a time when the NDP was polling much more highly in B.C. than they are now. The provincial Greens also elected their first MLA in a riding within Victoria's boundaries, putting it high on the list of winnable seats. Former CBC radio host Jo-Ann Roberts will be taking a run at it. Third is Esquimalt - Saanich - Sooke, where the Greens took 13% of the vote in 2011, against 39% for the NDP. It is another riding at the southern end of Vancouver Island, where the Greens seem to have their support concentrated. Frances Litman, a photographer and former journalist with the Victoria Times-Colonist is running for the party. The ridings in this first tier are the ones I'd expect the Greens to win if the campaign goes well for them. After this (and adding Hyer's riding to the list), we're entering into historic breakthrough territory. Heading the list of ridings in the second tier is Yukon. The Greens took 19% of the vote there in 2011, finishing not far behind the Conservatives, who won it with 34%. Bizarrely, former Green Party of Ontario leader Frank de Jong is gunning for the nomination here. I'm not sure how much of a premium that will give him, but he will have a lot of campaigning experience. Complicating matters is that Yukon is a riding the Liberals are likely to win, considering their gains since 2011. Next is Dufferin - Caledon, the traditionally strongest riding for the Greens in Ontario. The party took 15% of the vote there, will behind the Conservatives 59%, but again that critical mass of voters is present. North Okanagan - Shuswap is not your normal Green riding, being in the B.C. Interior. But with 11% support in 2011, and a Conservative Party experiencing a steep dive in support in British Columbia, it is one that would be on the Greens' list if they are boosted high enough to win six seats. Moving on, Calgary Centre is an interesting one for the Greens. The party captured 10% there in 2011, well behind the Tories, but then took 26% of the vote in the 2012 by-election. They had a good candidate in Chris Turner, who won't be back, but again we're talking about a mass of voters who have proven willing to cast a ballot for the Greens. Back to B.C., South Okanagan - West Kootenay is in the same boat as the North Okanagan riding, requiring a big slip in Conservative fortunes. And moving back to Vancouver Island, Cowichan - Malahat - Langford would be on the list of 12 for the Greens. They took 7% in 2011, against 44% for the NDP, but if the Greens win those three first tier ridings on Vancouver Island, the tide could bring in Cowichan - Malahat - Langford as well. The fourth tier has a few interesting ridings, and a few long shots. Winnipeg Centre is one of the latter, as the Greens took just 7% of the vote here in 2011. But the NDP has fallen on hard times in Manitoba, and the Greens could potentially benefit if their campaign is going well enough. Add another Vancouver Island riding to the list: Nanaimo - Ladysmith, which had similar numbers to Cowichan - Malahat - Langford and could fall to a hypothetical Green surge on the Island. If the Greens have a pocket of support on Vancouver Island, they also have one in cottage country north of Toronto. Bruce - Grey - Owen Sound is a riding where the party hit double digits with 10% support, but would have a hard time toppling the Conservatives, who captured 56%. However, if the Greens are to obtain official party status they are going to have to do some unexpected things. Like win two seats in Calgary? Perhaps not. But with 14% in Calgary Confederation in 2011, there is a base with which to work in this riding. Last on the list is a riding that would normally be a lot higher. Vancouver Centre was one of the best ridings in the country for the Greens in 2011. They took 15% of the vote, with the Liberals winning it with just 31%. But there's the problem. The Liberals are on track for big gains in British Columbia, putting Vancouver Centre out of reach. One might suppose that if the Greens are winning a dozen seats, they are likely eating into the Liberal vote significantly in a riding like Vancouver Centre. So the riding could be higher on this list than it actually is. The target for the Greens may not need to be as high as 12 seats. If they did hold the balance of power, they might be able to demand recognition as an official party, despite winning fewer seats than the customary dozen (they might get it either way, depending on how generous the government in power feels). At that point, things start to become a bit more plausible. Win all of the first tier ridings, plus Thunder Bay - Superior North, take Yukon with de Jong, Dufferin - Caledon in Ontario as the tide rises, and the Greens have six seats. Far from the realm of fantasy. It isn't impossible, but the Greens would need some serious momentum to win more than three seats (May's and Victoria, plus either Esquimalt - Saanich - Sooke or Hyer's) in 2015. The quest for 12 is a much more manageable one for the Bloc Québécois. In the end, they were victims of the first-past-the-post system in 2011 (after being a beneficiary of it from 1993 to 2008, so perhaps it was deserved) as the party captured over 23% of the vote in Quebec but won just four seats, fewer than the Conservatives and Liberals who each took less than 17% of ballots cast. And with the province seemingly divided among four parties, the Bloc can come up the middle and win a lot of ridings with less of the vote than they had in 2011. So, that makes the Bloc's path to 12 a lot easier to map out. They just need to get over a low bar, and the luck-of-the-vote-splits will have a lot to do with it. For that reason, I haven't split the Bloc's ridings into tiers. But here are 14 prime candidates, from which the dozen seats the Bloc needs can be drawn. Many of the seats are located in the regions between Montreal and Quebec City. Bécancourt - Nicolet - Saurel, held by Louis Plamondon, is the most likely to stay within the Bloc fold. Nearby Richmond - Arthabaska may no longer have André Bellavance on the ballot, but the party did win it in 2011. However, the Conservatives will be targeting this riding. Sherbrooke is also a riding that could go back to the Bloc. On the other side of the St. Lawrence, Saint-Maurice - Champlain and Berthier - Maskinongé in the Mauricie region could be won by the Bloc, though Ruth Ellen Brosseau has done more than most NDP MPs in Quebec to ingratiate herself to the locals. The Bloc has a few seats to target south of Montreal: Saint-Jean, Salaberry - Suroît, and Pierre-Boucher - Les Patriotes - Verchères. In all three of these, the Bloc will be facing off primarily against the NDP. North of Montreal, seats the Bloc would be most likely to win if they are to reach 12 would be Montcalm, Repentigny, and Laurentides - Labelle. Again, their main opponent here would be the New Democrats, though the presence of a Forces et Démocratie incumbent MP in Repentigny complicates matters there. In eastern Quebec, the Bloc could take Rimouski-Neigette - Témicouata - Les Basques and Beauport - Côte-de-Beaupré - Île d'Orléans - Charlevoix, though in the latter they will have to vie with the Conservatives as well as the NDP. Honourable mentions in this part of the province should go to Avignon - La Mitis - Matane - Matapédia and Gaspésie - Les Îles-de-la-Madeleine, both of which the Bloc took the most votes in during the last election (the latter was won by the NDP, but with the new boundaries it goes Bloc). The first riding is an interesting one since it was won by the Bloc's Jean-François Fortin, who will be leading Forces et Démocratie and likely has a better chance to win it for them than the Bloc does. Lastly, there is the riding of La Pointe-de-l'Île in eastern Montreal, where party leader Mario Beaulieu will be making his stand. 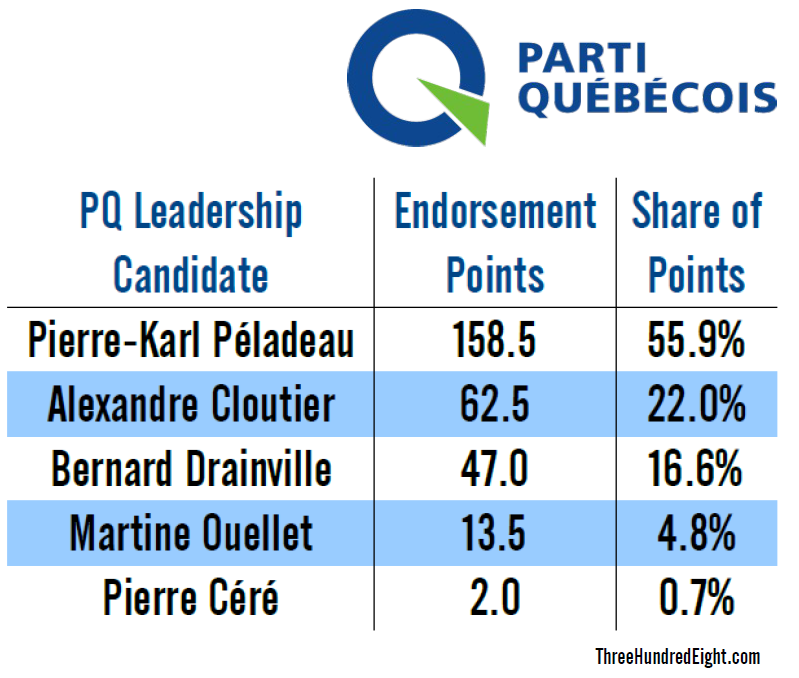 It is a riding that wouldn't necessarily be very high on the list without Beaulieu, but we can bet that the party will be pulling out all the stops to get its leader elected. The odds of the Bloc achieving official party status is certainly much higher than those of the Greens, numerically at least. But it is easier to imagine a scenario in which the Greens are awarded official party status despite not reaching the 12-seat mark than it is the Bloc. If both did manage it, though, it would bring us back to the time of the 1997 and 2000 elections, when five parties had at least 12 seats in the House of Commons. I don't think we're quite likely to have a fully-fledged five-party system starting this year, but it is interesting that we're now in a position where that is part of the conversation. A tangential, unlikely part. But a part nonetheless. 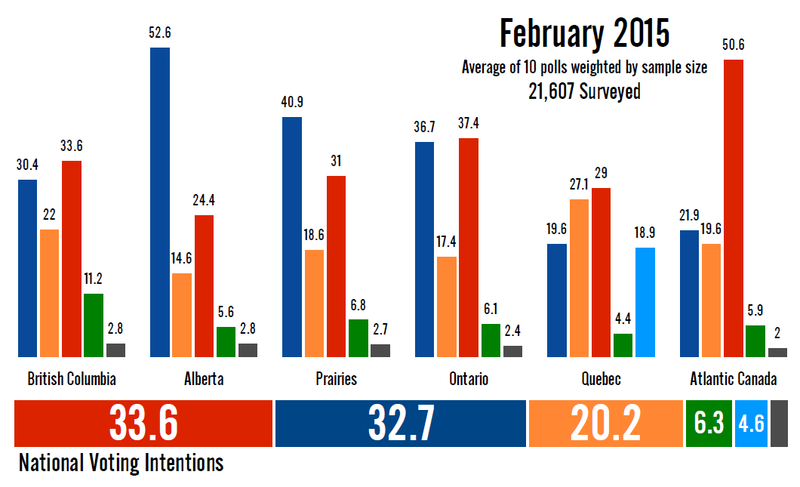 It was a busy month in the polling world in February, as one Quebec and nine national polls were published, surveying over 21,000 people. The result? Very little movement since last month, when it seemed the Liberals were on track to lose the lead. Instead, they've held on for the 23rd consecutive month. Note that the monthly averages are separate from the standing projection at this site. The projection decays polls every week, so polls taken in early February would be worth less than those taken at the end of the month. The monthly average treats all polls conducted in the same month equally, with only the sample size being a factor. The Liberals led with 33.6% support in February, up 0.1 point from the previous month. This halts a period of decline for the party, which has fallen from the high of 39% they recorded in July. The Conservatives were down 0.4 points to 32.7%. Nevertheless, this is still the best two months the Tories have put together since January 2013. The New Democrats slipped 0.8 points to 20.2%, while the Greens were up 0.3 points to 6.3% and the Bloc Québécois was down 0.1 point to 4.6%. An average of 2.6% of Canadians said they would support another party or independent candidate. In terms of the polling spread, the Liberals' position improved slightly. With the exception of a Forum poll that put the party at 39%, all polls had the Liberals between 32% and 36%, compared to a range of between 31% and 34% in January. The Conservatives, ranging from 31% to 35%, saw no change, while the NDP's range was down from 19% to 24% in January to 17% to 23% in February. The Liberals led in British Columbia with 33.6% support, an increase of 2.6 points from January. The Conservatives were down 0.2 points to 30.4%, while the NDP was down 2.7 points to 22%. That was the NDP's worst result in B.C. since July 2009. The Greens were down 0.1 point to 11.2%. The party has averaged either 10% or 11% in 11 of the last 12 months. In Alberta, the Conservatives were down 1.9 points to 52.6%. The Liberals were down 1.2 points to 24.4%, while the NDP was up 1.7 points to 14.6%, their best result since August 2014. The Greens were also up, by 0.6 points to 5.6%. The Conservatives were in front in the Prairies with 40.9%, an increase of 0.2 points. The Liberals were up 1.9 points to 31%. The NDP was down significantly, dropping 6.8 points to 18.6%. But the New Democrats have been all over the place in the Prairies, averaging 24% in October, 20% in November, 16% in December, and 25% in January. Hard to discern a trend there, but the Greens were up 3.2 points to 6.8%. The Liberals were narrowly ahead in Ontario, dropping 0.6 points to 37.4%, their worst since April 2014. The Conservatives were up 0.3 points to 36.7%, putting them in a (rounded) tie with the Liberals for the first time since July 2013. The NDP was down 0.5 points to 17.4%, and the Greens were unchanged at 6.1%. In Quebec, the Liberals were up one point to 29%, but that still represents their worst two-month polling since Justin Trudeau became party leader. The New Democrats were steady at 27.1%, while the Conservatives were down a point to 19.6% (their best two-month period since August-September 2011). 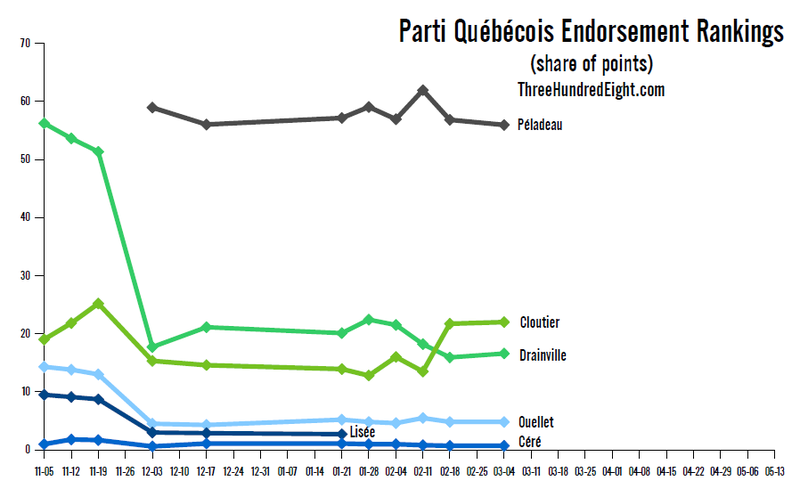 The Bloc Québécois was up 0.4 points to 18.9%, and the Greens were up 0.3 points to 4.4%. The Liberals gained 1.2 points in Atlantic Canada and led with 50.6%. The Conservatives were down 4.3 points (the largest shift recorded this month apart from the NDP slide in the Prairies) to 21.9%, and the NDP was up 1.2 points to 19.6%. The Greens picked up two points to reach 5.9%. With these levels of support, the Conservatives would likely win about 143 seats, up six from the January projection. The Liberals would take 127 seats, up three, while the NDP would take 63, a drop of nine. The Bloc and Greens are unchanged at three and two seats, respectively. The Conservatives made gains in Ontario (five seats), the Prairies (three), and British Columbia (two), but dropped in Quebec and Atlantic Canada (two each). The Liberals made inroads in Quebec and Atlantic Canada (two apiece) as well as British Columbia, the North, and the Prairies (one apiece), but dropped four in Ontario. The NDP slipped one seat in both the North and Ontario, three in British Columbia, and four in the Prairies. The overall picture, though, points to general stability in the numbers with the Liberals and Conservatives being within a hair of each other. A new premier, taking over a party that has a stranglehold on the legislature, will likely seek a mandate of his own this spring. Against him will be a trio of rookie opposition party leaders, who will be going on the hustings for the first time themselves. The Official Opposition leader will have the least amount of time for voters to get to know him, as the party was the last to fill the slot. And the party has had a very tough time. Since the last election, the caucus has been reduced significantly due to floor-crossing and the departure of its leader, who could no longer sit with her party in the legislature. It's been a whirlwind few years in Charlottetown. Wait, did you think I was talking about Alberta? Why no, this political drama has been taking place in Canada's littlest province! That new premier is Wade MacLauchlan, who was just a few weeks ago named as former premier Robert Ghiz's replacement. His party took 22 of 27 seats in the 2011 provincial election, leaving the Progressive Conservatives under Olive Crane to provide a tiny opposition (to put it into perspective, a similarly sized opposition in the House of Commons would have 57 seats). The Tories have been in turmoil for most of the last few years. Crane announced she would resign as leader at the end of 2012, and MLA Hal Perry took over Official Opposition duties. But then Steven Myers won the interim leadership in early 2013, and for a confusing few days Perry wanted to stay as opposition leader as Myers ran the party. That didn't last very long, and by the end of the year Perry crossed the floor to the Liberals and Crane was booted out of the party and has been sitting as an independent ever since. Rob Lantz was named the new leader of the PCs on February 28, and will be one of four rookie leaders in the upcoming campaign. Mike Redmond will be leading the NDP and Peter Bevan-Baker will head up the Greens. In 2011, the leaders of these respective parties had been James Rodd and Sharon Labchuk. The new poll by Corporate Research Associates shows that the Liberals are doing very well under MacLauchlan (though he was named Liberal leader on February 21, late into CRA's polling dates, nominations closed at the end of January and MacLauchlan was the only candidate). The party led with 58% support, up eight points since CRA's previous survey of Nov. 5-25. The Progressive Conservatives were up slightly by three points to 26% (their numbers are pre-Lantz), while the NDP and Greens were down three and seven points to 12% and 4%, respectively. Nevertheless, this is the best number the Liberals have put up in any poll since August 2011, just before the last election. And this after a period of stability, as the party was polling between 48% and 53% between November 2013 and November 2014. Indeed, with only a few exceptions, the party has barely wavered from the 50% mark since the last vote. For the Tories, their results are par for the course as the party has been polled at between 23% and 28% since May. It will be interesting to see what effect Lantz has on the numbers. He takes over a party that is in better shape than it was in 2013 and early 2014, when the New Democrats were in second place. 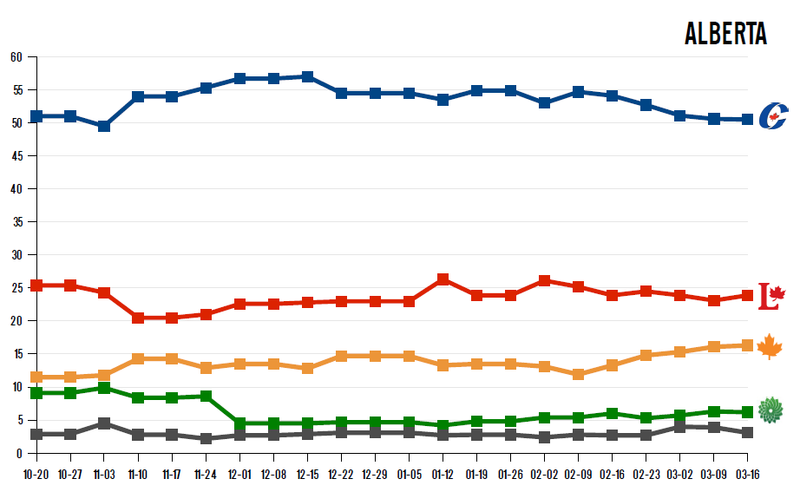 The NDP has been steadily dropping, however, and this latest poll is their worst since February 2012. The Greens were at an anomalous 11% in November, so the drop of seven points is somewhat exaggerated. Normally, the party polls between 3% and 7%, so they are well-within those levels. With such a wide lead over the opposition, MacLauchlan would preside over another landslide if an election were held today. He'd likely win 25 seats, with the Tories taking the other two. Again, to put that into perspective, that is the equivalent of a government winning 285 seats in the current 308-seat House of Commons, with the opposition winning the remaining 23. On who would make the best premier, MacLauchlan was well ahead with 42%, one point up on Ghiz's performance in November and better than any numbers Ghiz managed since the last election. Myers, in his last poll as interim leader, was at just 10%, while Redmond was at 14%. That was a drop of three points and his lowest number as NDP leader. Prince Edward Islanders seem satisfied with the government, with 44% saying they are completely or mostly satisfied, compared to 30% who are dissatisfied. The remaining 26% aren't sure, an understandably big jump from 8% in November considering the change in leadership. So MacLauchlan stands a strong chance of securing a mandate of his own when the next election is called. The wildcard will certainly be Lantz, who has a chance to give the Tories a fresh face and a new start. With so few voters in the province to persuade (75,000 in 2011), dramatic swings can easily occur. But the hill may be too high to climb for Lantz in such a short time.